The following example demonstrates how you can use the ODS EXCLUDE statement to exclude particular objects from ODS destinations. This example also creates a SAS data set from the excluded table and uses it to create a specialized plot. The ODS HTML statement specifies the filenames to contain the output generated from the statements that follow. The ODS EXCLUDE statement excludes the table ParmSearch from display. Although the table is excluded from the displayed output, the information contained in the ParmSearch table is graphically summarized in a later step. All output from PROC MIXED, except the ParmSearch table, is delivered to the HTML destination. The ODS OUTPUT statement outputs the table ParmSearch to a SAS data set called Parms. 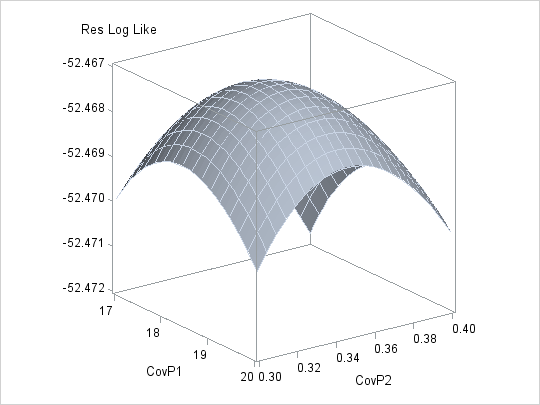 PROC TEMPLATE is used to create a template for displaying the data as a three-dimensional surface plot. The plot is displayed with the ODS Graphics procedure SGRENDER. For more information about ODS Graphics, see Chapter 21: Statistical Graphics Using ODS.